While jazz had almost from the start been heard on college campuses as the sound track to college dances, college concerts were surprisingly the last frontier for jazz musicians. Dave Brubeck’s wife Iola changed that in the early 1950’s when she thought up the idea of bringing jazz to the college students. She wrote numerous colleges on the West Coast about the possibility of bringing her husband’s jazz group to play in concert, and soon enough the Brubeck Quartet was performing for enthusiastic students on campuses coast to coast. As revolutionary as this idea was, Dave Brubeck took it a step further by releasing part of a college concert in an album. The source of the music on this album is a radio broadcast, recorded by the Oberlin College. 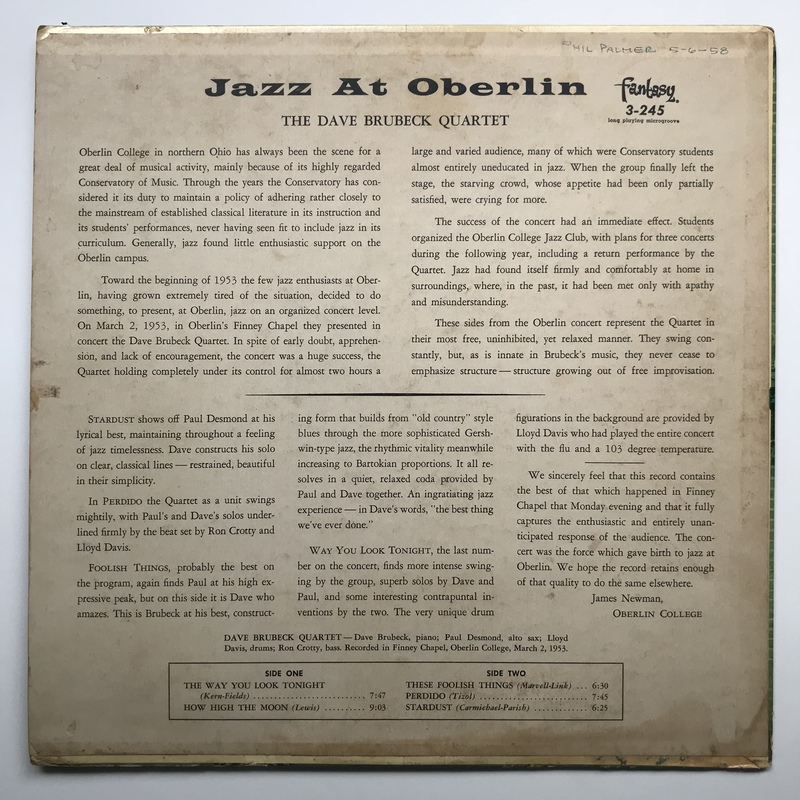 Brubeck asked about the possibility of making an album from the tape after the concert, and in a shrewd business deal got the tape by allowing Oberlin to rebroadcast it whenever they wanted. The resulting album became one of Brubeck’s most popular and one of the best live jazz albums of the 20th century. The music captures the Dave Brubeck Quartet playing in a fashion that had never appeared on records before and wouldn’t appear on records again. Paul Desmond is red hot and absolutely smoking, sounding more like Charlie Parker than the Paul Desmond of later years. Dave Brubeck, for his part, sounds like Brubeck. His solos employ full use of both hands, delivered with tenacity and vigor on the up-tempo tunes and tender rhapsody on the two ballads. Ron Crotty, Brubeck’s bassist from the trio days, is on hand to hold things down while drummer Lloyd Davis keeps things swinging with well-placed accents. The member of the quartet that really kept the fire going, however, is the audience. Brubeck and Desmond often talked about how an audience can make or break the performance, with Brubeck going as far as to call the audience the “fifth member” of the quartet. On this record, the musicians are catapulted into the stratosphere by the young collegiate audience’s wild enthusiasm and positive reception. This is no staid group of people politely clapping, or even a jazz club of people tepidly clapping after each solo- this is an electrified audience that isn’t afraid to show their approval with cheers and applause, even if it is in the middle of a solo. Either that or the audience, made up of mostly classical music conservatory students, simply wasn’t aware of jazz audience etiquette. This wonderful lack of etiquette is on full display on the group’s performance of the jam session favorite, “Perdido”. From the jump, the fire is lit and Desmond is off to the races, swinging so hard and tastefully that he elicits applause just after his first chorus! Desmond’s flight of fancy reaches a fever pitch going into his fourth chorus that when he takes a breath to continue, the audience is again moved to applaud and cheer. So distinctly different yet cohesive is this solo line, when I was younger, I thought another saxophonist had started to solo, hence the applause. Nope. It’s just Desmond. When he finally does finish his solo, the audience erupts with a roar of cheers, whistles, and applause. Brubeck’s ensuing solo maintains the excitement, quickly transitioning from a single line into two-handed, “let’s see how many ways I can rearrange the piano keys” piano playing. As was customary in the early days of the quartet, Brubeck and Desmond engage in improvised counterpoint, getting some mileage out of a “Tea For Two” reference before going off on their own thing. The rest of the album is on the same level, with some particularly miraculous moments “The Way You Look Tonight”. But I’ll save that for another post. Our friend Scott Yanow over at Allmusic calls this album “a touch underrated”. I agree. Especially when one considers how influential and far-reaching this album was. After this album, Brubeck went on to make another four albums recorded live at college concerts, and college dates became Brubeck’s bread and butter in the 50’s and 60’s. Chet Baker, Bud Shank, The Mastersounds, and Thelonious Monk are just some of the jazz musicians that recorded albums on college campuses in the aftermath of Brubeck’s appearances. One wild example of Brubeck’s appearance at Oberlin? Future jazz guitarist Jim Hall was sitting in the audience that concert as an Oberlin student. I wonder if he had any idea that day in 1953 that he would start making albums with Paul Desmond six years later? One of the cool things (or annoying, depending on how you look at it) about collecting vintage records is finding old signatures and inscriptions written on the album jackets or even the records themselves. In this case, not only is the previous owner’s name written on the back, but presumably the date he bought the album. This is one of the coolest things I’ve seen on an album. To think Mr. Phil Palmer walked into a store and bought this album on Tuesday, May 6th, 1958, almost exactly 60 years ago, is wild. Who was Mr. Palmer? Where was he from? How old was he in 1958? So many questions. Sentimentality aside, the back features a set of liner notes that are both informative and lacking in information. In other words, classic Fantasy liners. In this case, the writer was a student by the name of James Newman, Oberlin class of 1955. 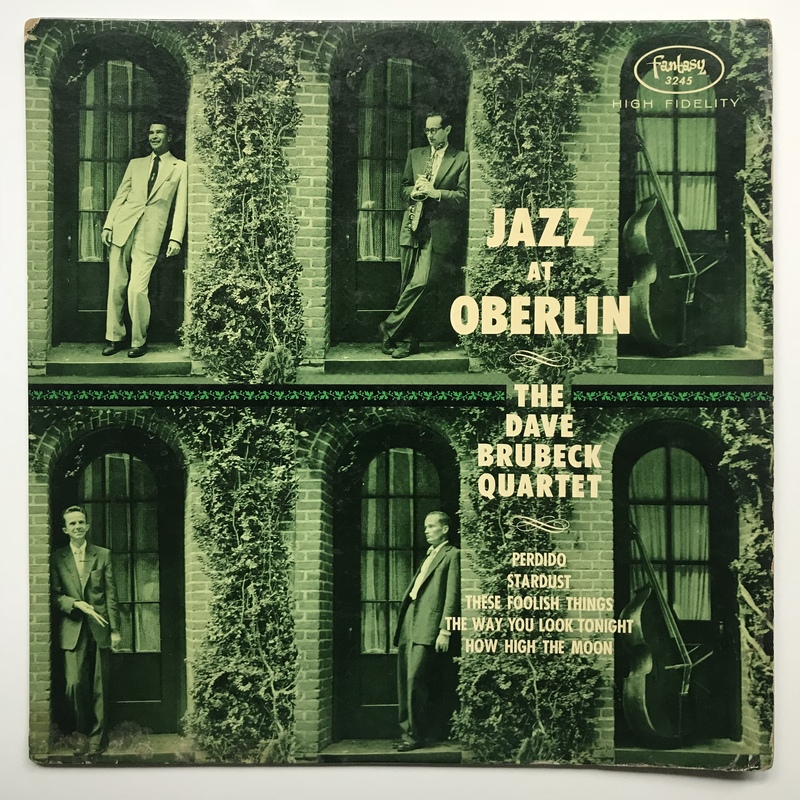 James Newman has an interesting history, the most relevant being that he organized the Oberlin College Jazz Club which brought Brubeck back the following year. Pretty neat. The liner notes and information is another example of Fantasy simply reproducing the notes from the 10-inch album and pasting it on the back of the 12-inch album. As a result, there’s no info on “How High The Moon”. They do however articulate the circumstances surrounding the concert, which are interesting and add to the experience of listening to the music. In classic Fantasy fashion, the music was pressed onto translucent red vinyl. This record is heavy and thick, with deep groove and the marbled dark red label, indicating a pre-1960’s manufacturing date. The music is in mono, with crackles not unusual for a 60-year old record that was well-played in its youth. Interestingly, despite this being a Fantasy Records album, the inner sleeve that came with the album when I bought it was from Columbia Records. It has some delightfully retro instructions and information about how to care for records, including different types of needles. Can you even by any other type of needle beside diamond anymore? Reading those estimated lifespans of record needles and the suggested times to change them, one wonders how any record over the age of 30 made it out of the 20th century unscathed. And check out that record player. Mercy. I’m sure the sound it got was something else. The local record store here in north Alabama has always treated me well. On this particular trip, made after class three years ago, there were quite a few Brubeck albums for sale. Being a Brubeck fanatic, I had to buy ’em. Luckily, despite screaming “RED VINYL!”, the price tag was well within my budget. If you’ve made it this far, I suppose you care enough to want to know about those ‘recent events’ I mentioned at the beginning of the post. I graduated from college last week, rendering my old name ‘College Jazz Collector’ moot. Suggestions for a new name? I can’t think of any off the top of my head. Maybe West Coast Jazz Collector, which is both accurate and wrong. Well, at least I now have time to think about it.